Movies like that are worth seeking out and embracing with both arms. 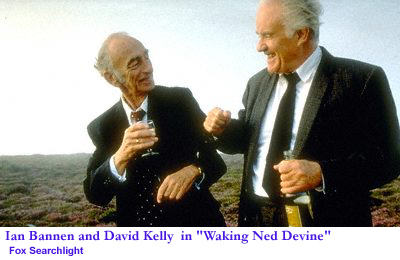 "Waking Ned Devine" is such a movie. Made in the United Kingdom (on the Isle of Man) with a cast of unknowns, the movie engenders such a feeling of warmth you'll swear you've had a drop of the most heavenly whiskey west of the Emerald Isle. Aging roustabout Jackie O'Shea (the late Ian Bannen) has discovered that someone in the tiny town of Tulaigh Morh has won the jackpot in the Irish lotto. He, his best friend Michael O'Sullivan (David Kelly) and his long-suffering wife Annie (Fionnula Flanagan) set out to ingratiate themselves amongst the townsfolk to find out who the lucky winner is. And a charming lot the townsfolk are, for the most part. There's Finn (James Nesbitt), a pig farmer who has a deep, abiding love for the lovely poet Maggie (Susan Lynch) who returns his love, only she can't stand the smell of him. There's the amorous store clerk, Mrs. Kennedy (Maura O'Malley), and certainly not least, there's the vicious Lizzie Quinn (Eileen Dromey), a mean-spirited cross between Lizzy Borden and the Wicked Witch of the West, only less friendly. She's the type of woman who rides a wheelchair not because she's disabled, but because she likes rolling over other people's feet. 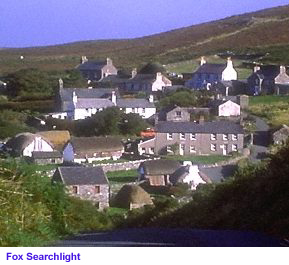 Jackie, Michael and Annie rule out the townsfolk one by one until they figure out who it is: Ned Devine (Jimmy Keogh), a fisherman who lives in the remotest section of town. Trouble is, when they go to visit Ned, they discover that the shock of the lottery win has stopped his heart. Therefore, the three perpetrate a bit of a scam; to convince Jim Kelly, the representative of the Irish Lottery (Brendan Dempsey) that Jackie is Ned Devine, and claim the winnings for themselves. Unfortunately, the early arrival of Kelly (signaled by the unmistakable sound of the poor man's hay fever) puts their plans in a tizzy and the less, ummmmmmm, untruthful Michael is forced to assume the role of Ned. However, when Kelly explains that he has to verify Ned Devine's identity with the townsfolk, and that the amount of the jackpot is several MILLION pounds instead of a few hundred thousand as they expected, they must involve the entire town. Some are willing than others. The acting is so good you can't tell that anyone is acting. These all seem like real people who have wonderfully rich lives. Every character has character, and there's a sweetness about the movie that hits every charm button you may have. It's a shame that Bannen passed away in a traffic accident a year after the release of this movie; he makes the most charming rogue that I have seen onscreen since Darby O'Gill. The term "feel-good movie" is tossed about in reviews and on daytime shows without regard, but this film defines it. The movie not only feels good, it makes YOU feel good about watching it. It's the kind of movie you won't be able to avoid telling your friends about, and it's one you'll almost certainly want to own once you've seen it. 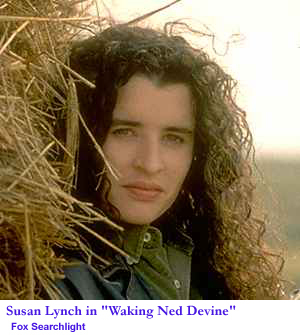 If you need a pick-me-up after the world has kicked you around some, "Waking Ned Devine" is tonic for the troops. It's an intimate movie that fits snugly onto the small screen; Amazon.com is standing by. 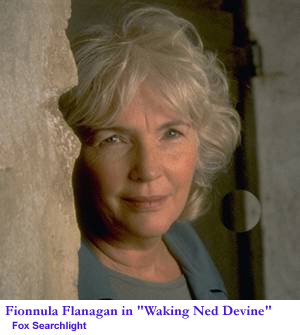 See cast, credit and other details about "Waking Ned Devine" at Internet Movie Data Base.